July 5, 2015 – Circus Mirandus – A Review. Synopsis: Even though his awful Great-Aunt Gertrudis doesn’t approve, Micah believes in the stories his dying Grandpa Ephraim tells him of the magical Circus Mirandus: the invisible tiger guarding the gates, the beautiful flying birdwoman, and the magician more powerful than any other—the Man Who Bends Light. Finally, Grandpa Ephraim offers proof. The Circus is real. And the Lightbender owes Ephraim a miracle. Thoughts: Circus Mirandus has gathered quite a bit of hype, which combined with its inviting cover, resulted in my purchase of a copy. Before I proceed with further thoughts, I should also mention the spicy, black and white illustrations of Diana Sudyka are dispersed throughout–and they transport you. They are incredible. I finished the 304 pages in less than 6 hours, partly because I couldn’t put it down and partly because Beasley writes with such skill that the words practically dance off the page and into your head–to the music of pipes and drums, no less. Truthfully, I was laughing one sentence and crying the next–all the while reading aloud portions of her character descriptions to my husband across the room. I found within the pages characters crafted with such depth, and yet, honesty, that after meeting them, I understand certain people in my own life better for it. There are many a good book that I can curl up with and enjoy, but it has been a long time since I’ve read something so profoundly beautiful. And so, I have to confess, in its rarity and unexpected depths, this masterful book has changed me. Reminded me of the magic. It’s about magic, friendship and loss. It’s about the people we love and why we love them. Circus Mirandus can be read and re-read (which will certainly be the case in my house), only to find some new magic upon your next return. 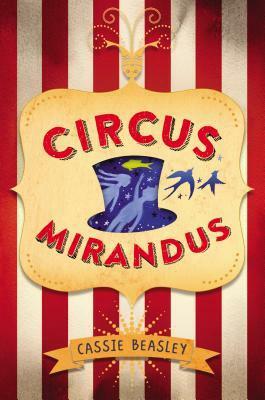 The only ticket you need is a copy of this book– so go out and buy or borrow it, but you truly must read it–even if there’s only one book you read this summer, Circus Mirandus is calling. This entry was posted in Uncategorized on July 6, 2015 by TheSmitlyJotter.